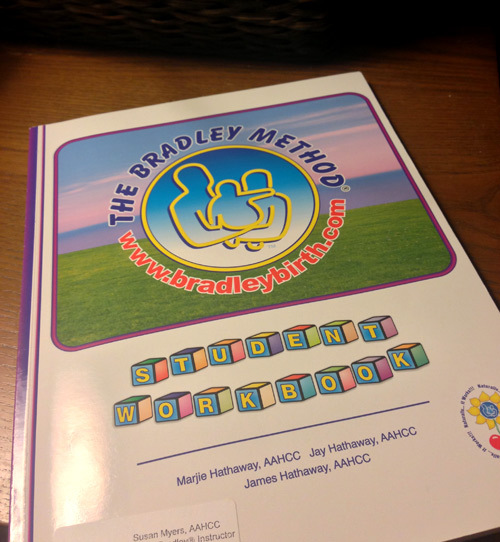 I'm finally getting around to doing my write up on our Bradley Method class! Regardless of what anyone chooses, I think it's so important to take some sort of birthing class. Educate yourself! Know what's supposed to happen during labor and prepare yourself. Know what you'd like, what are the different options, why doctors do certain procedures. Pick a class that goes along with your views. Do you want to learn to mediate through your labor? Do you want your partner to play an important role? Do you just want to know the basics? The Bradley Method encourages a natural labor with heavy emphasis on help and guidance from your coach. It's a 12 week class that teaches you things like good nutrition, exercise and relaxation, the emotional and physical stages of labor and care after labor. Why did I choose Bradley Method? I know I wanted a natural birth. I do not like drugs and not being in control of my body. I also liked the idea that it wasn't all about the mother and her labor, it was about both the coach and mother going through labor together. I wanted Rob to help me through this since I know he helps and supports me so much already. We make a great team. And after all, it's OUR baby that's coming into this world. I looked around the web and found Susan who taught the class not too far from our home. She couldn't have been more perfect. Ok, when Rob looks at me and say, "This is one of the best things we've done." you know this class was worth it. Rob let me choose this class because he knew it was important to me, but in the end he learned how valuable it actually turned out to be. Susan was very thorough in each class. She would teach us about the importance of preparing not only our bodies, but our minds for labor. We practiced a lot of relaxation, which is so good not only in labor, but dealing with everyday occurrences. We learned about all the different procedures, drugs and other hospital related things that happen during labor. She hardly ever was like, "Drugs are evil!!!" more like, "Most of the time you don't need the drugs, but there is a time and place for them." She went into great detail about the different stages of labor, what to do, what the coach should do, what sort of emotions to expect at each stage and how to make labor work the best for you. I thought learning about the emotional side of labor was so informing. It makes things a lot less scarier. We also learned about breast feeding and newborn care. She pretty much covered everything! The class was a lot of fun. It sparked a lot of conversations between me and Rob and what we want for our birth. It was great to have Rob say to me like, "You know I think we should do this. That's important." He never would've said anything like the before. Actually, Rob thought I was crazy at first when I first mentioned wanting a natural birth. This is the choice I am making for myself and my labor. I know myself. I try not to preach to others about wanting to go natural (but i have been known to say some stupid things that i regret). Having drugs or having a C-section are other people's choices. If you want a natural birth, educate yourself. Prepare yourself before hand. Learn about yourself and your body. Have someone with you who supports you. Keep an open mind and know that your birth plan is not something that will be followed exactly. Know that things can go happen and accept it. I know that in the end, I may not have a natural birth, but I want to know that I at least tried. Also, I know that the relaxation and other techniques will greatly help. I'm so grateful for all the things I learned in our class. Sure I'm anxious and scared sometimes about going into labor, but I know how to calm myself and I know that Rob will always be next to me. And once we go through labor, I'll make sure I write about what I learned and how I really felt about it. I loved having my natural births at home with my kids. I didn't take any classes to prepare me but I talked with my midwives over the course of the months and I was aware of my options and was confident it would all be okay. I think for me, not having any expectations was great for me. Had I had a birth plan and it did not go to plan I might have felt disappointed and regrets and I am pleased that that route worked for me. It is nice you guys have found the Bradly Method classes to be so useful and so nice and I am sure you are going to do fine. Just trust in your body, trust in Rob, trust everything will go according to plan and it will be fine. It will be the most memoriable experience of your life and when you are done you are going to feel not only in awe of how capable you were but how empowered it will make you feel.